Designed in Italy, Chicco's 360-degree rotating hook-on chair has an innovative seat that locks in 6 positions for happy and interactive mealtimes.Face baby toward mom for one-on-one feeding. Face baby out to keep him happy and let others entertain him. Face him forward toward the table for regular mealtimes with snap-on tray. Snap on serving tray provides a neat and clean surface for meals at home or away. Washable fabric seat pad and dishwasher-safe tray make clean up easy. Rubber grips clamps to table quickly and securely negotiating table skirts up to 5.5" thick and the yellow highlighted buttons won't leave you searching for how to adjust the chair. 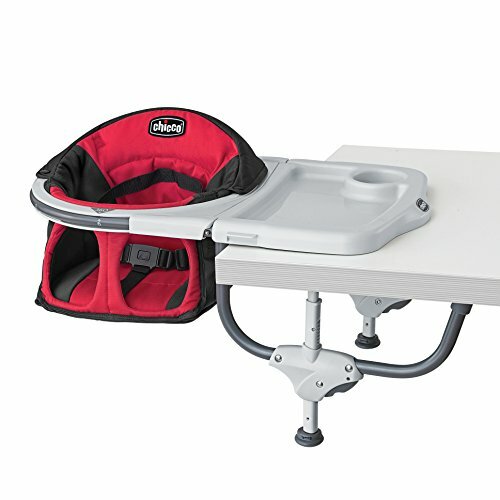 With a compact fold and deluxe carry bag, the Chicco 360 is great for picnics, restaurants or the grandparents!